50 minutes' flight southeast from the bustle, cruise ships and tourist-centric Nassau, capital of the Bahamas, lies the sleepy island of San Salvador. 12 miles long and 5 miles wide, she is the tip of an underwater mountain rising from five thousand metres below (fifteen thousand feet) surrounded by picture-postcard, crystal-clear, blue seas. Now home to 1200 Bahamians, "San Sal" has a past as colourful as her long sandy beaches are white. The native Lucuyan Indians who had settled there around the 6th century AD called her Guanahani, then Columbus made his first landfall here in 1492 and renamed her San Salvador, or Holy Saviour. In his journal he noted "the beauty of these islands surpasses that of any other". I would disagree as, great traveller as he was, he didn't have air miles and had just spent weeks on end staring at the horizon wondering where in salvation land might be. Alcatraz would have probably looked pretty stunning to him then too. That said, the long beaches are almost as deserted as they were then; there is one hotel chain and one 42-room, family-owned and run hotel on the island. In the 17th century British Buccaneer and Loyalist John (aka George) Watling took over the island. Fittingly for the island, he was known as the “pious pirate” as he forbade attacks and gambling on the Sabbath. The ruins of his large plantation house, estate, and lookout tower are still points of interest today. She only regained her current moniker in 1925 though, much to the chagrin of the locals, Club Med have tried to rebrand her as Columbus Isle. The centre of the island has many lakes and waterways and archaelogical points of interest on the sites of native Lucayan settlements and is home to a range of birdlife and wild hogs and goats. She can be explored by renting a car or golf cart, or on a guided tour. But these are small bonuses, San Sal's big draw is underwater. Whilst her windward east coast is often rough, the leeward side is mostly flat as a pancake, azure blue at the water's edge, turning to cobalt, sapphire, and finally indigo blue over the wall. It's only a short boat ride with Guanahani Divers to the wall that starts at 10 metres (30 feet) deep. Striding off the boat you can see the sandy bottom, a haven for stingrays, turning to coral reef, with fans and sponges acting as meeting points for grunts and snappers. 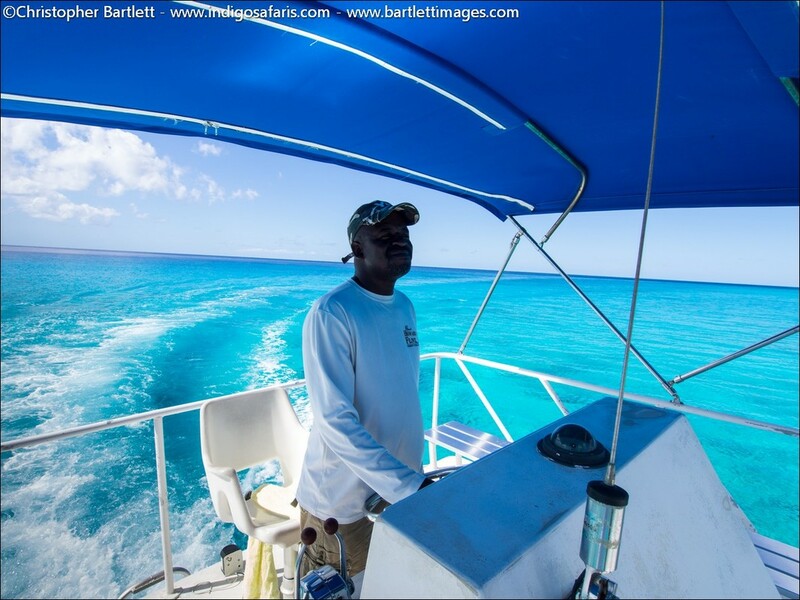 The hue of the blue and its 30 to 50-metre (90 to 150-foot) viz is mesmerizing in itself. Upon reaching the edge of the wall, more sizeable company generally turns up pretty quickly. Nassau groupers are common, jacks flit around, and the longest I waited to see a reef shark was two minutes. Most dives sites seem to be patrolled by two to four of our cartilaginous friends, either Caribbean Reef or Blacktip sharks. When the water temperature drops below 25C (76F) Scalloped Hammerheads return for the winter. 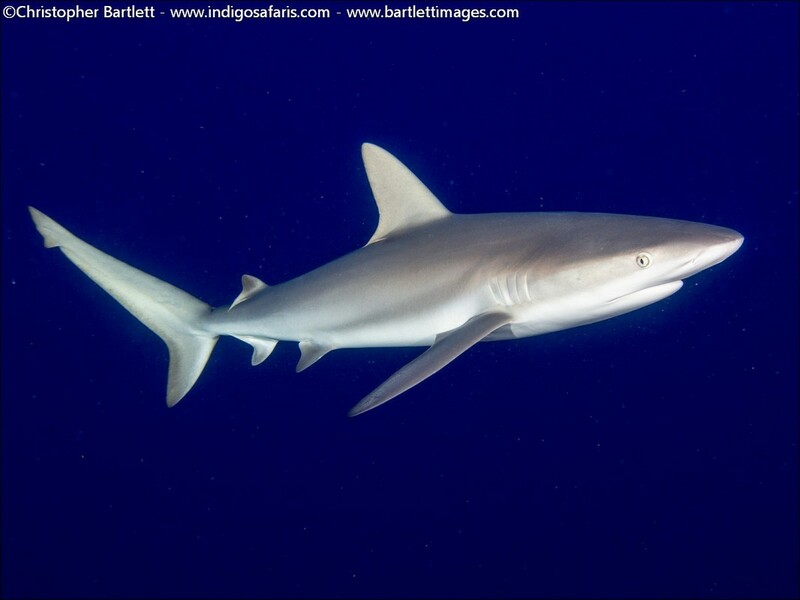 I've dived with sharks all over the world, and these ones come as close as any I've seen on a baited or fed dive, just without any food being put in the water, it’s a fantastic, natural experience. The topography of the wall is varied, with overhangs, cracks, swim-throughs, and some stunning chimneys; Santa Claus' chimney to the south of the island being a cracker (sorry), dropping from the top of the reef down to 40 metres (130 feet). The cracks and crevices shelter a variety of eels, lobsters, and shrimps, as well as gobies and blennies. The walls are adorned with barrel, rope, and vase sponges; a veritable feast for the healthy hawksbill turtle population. Throw in some wrecks, vertical coral pillars, the "Cathedral", and another 40-plus dive sites, and there is enough diving to keep you busy for at least a week. The twin-engine diesel inboard powered dive boat (one of two) is spacious, has oxygen, first aid equipment, and toilets on board, a shady dive deck, a sunny flybridge, a low platform to stride off and a wide-runged ladder to climb up. Back on shore, Michelle, Peaches, Jason and the crew of Riding Rock Inn provide simple. 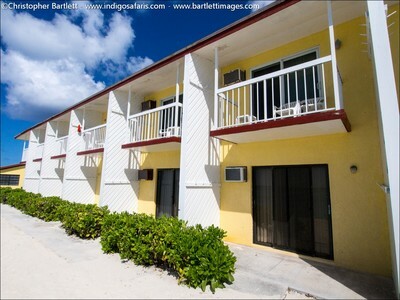 comfortable air-conditioned beach front accommodation, and three hearty meals a day (there aren't many skinny Bahamians). The Driftwood Bar on the premises offers free rum punch and conch fritters on Monday evenings. Cars or vehicles can be hired, and the main, but small, settlement of Cockburn (pronounced Coburn) Town is a 10-minute stroll down a sandy road. Nature walks, historical tours, and game fishing can be arranged. 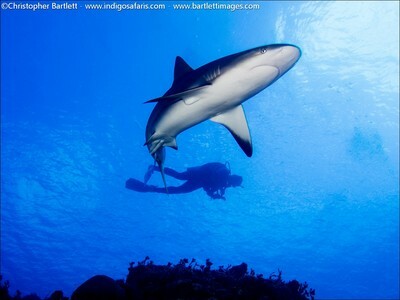 Regular rates are $2101 for 7 nights full board, 21 meals, and 17 dives, including a night dive. 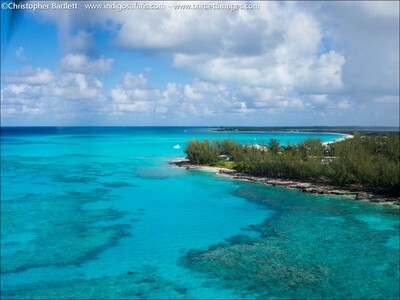 Daily return flights from Nassau are $200 and there are also several flights a week from Fort Lauderdale in Florida.